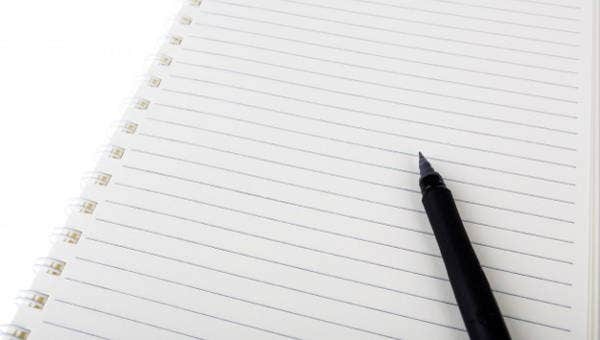 Here we have a collection of great HR resources for documenting your workers’ time on the job. 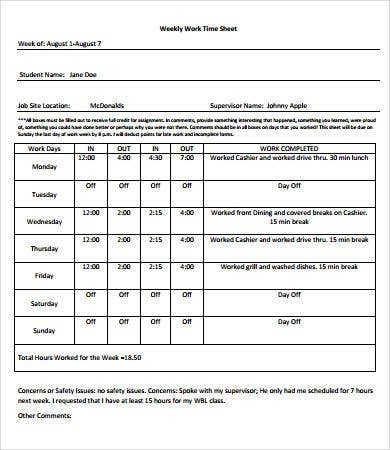 This is done using a time sheet, which is a table where you record details of clock-in and clock-out times, as well as break times. 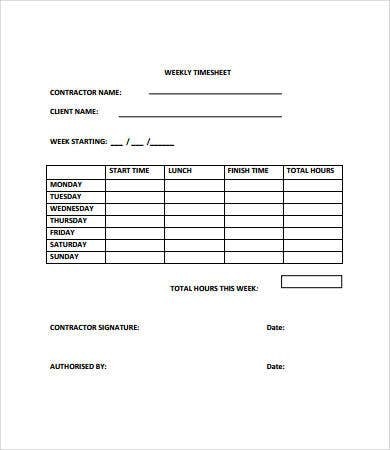 You’ll need some version of this form, whether digital or on paper, to make sure you are getting the agreed amount of working hours from your valuable employees. It doesn’t even have to be for a company. If you’re hiring volunteers for a summer camp, for example, or if you are hiring outside help from a contractor, a time sheet will make sure you have a handle on your personnel. 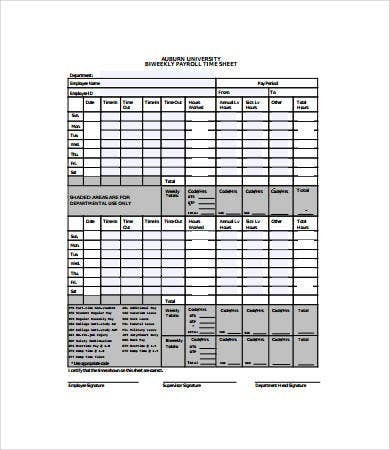 If you’re looking for a fast and easy Timesheet Template, you’ll find it here. Why Do I Need a Time Sheet? It is all in the interests of management and also professional fairness. You get what you pay for. But sometimes you don’t. When an employee or contractor signs a contract with you, they are selling you their time most of all, as well as their resources and energy on the job to get their tasks done. You are buying this resource from them. A time sheet would then act as a transaction record so every employee is paid for what they give. How Do I Use a Time Sheet? All that’s needed to do is to have one and make it part of the operational routine. 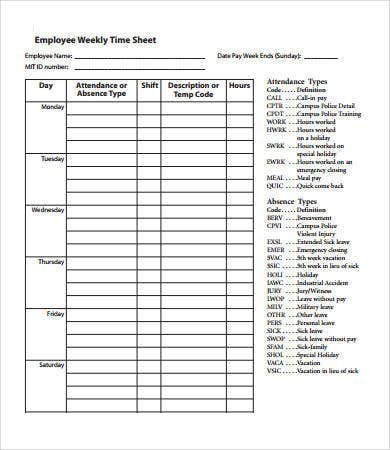 Every clock-in, clock-out, and break time should be recorded on the sheet where indicated. Some other details might be included purely for documentation and reference. At the end of a stipulated time frame, the amount of hours is calculated. Any overtime and undertime is noted and duly compensated or addressed. Tracking the time they put in is purely quantitative, and therefore easy to convert into payroll details, since companies normally pay by the hour. What Are the Different Time Sheet Options? This list gives you some options you might likely need. Using a Weekly Timesheet Template, you can tell where your investment in personnel is going. But since many companies release pay every two weeks, a Bi Weekly Timesheet Template might be handier to calculate for every payday from one sheet. 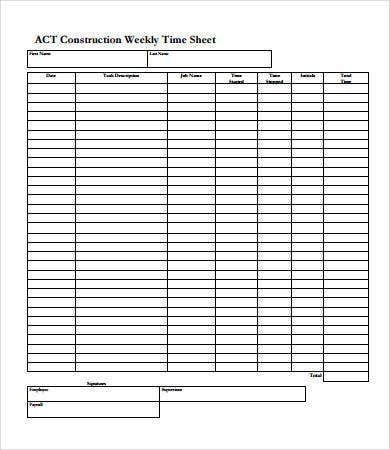 When contracting work, the Contractor Weekly Time Sheet Template and the Construction Weekly Time Sheet Template are immediately useful ways to keep track of your contractors and the time put in toward project completion. 10+ Excel Timesheet Templates – so you can keep records digitally; save paper and easily sync data across different computers. 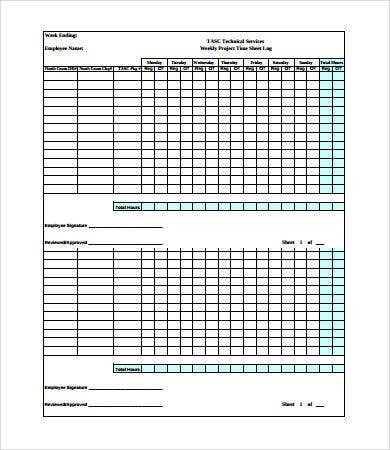 13+ Monthly Timesheet Templates – since these are the easiest and most common periods to record. 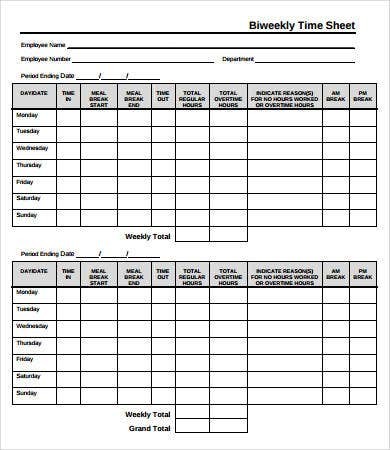 These Free Time Sheet Templates feature daily, weekly, and monthly templates. 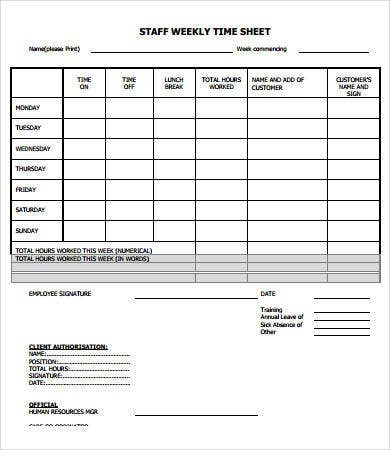 You can also find a good Hourly Timesheet Template if you’re going to be more scrupulous about it.